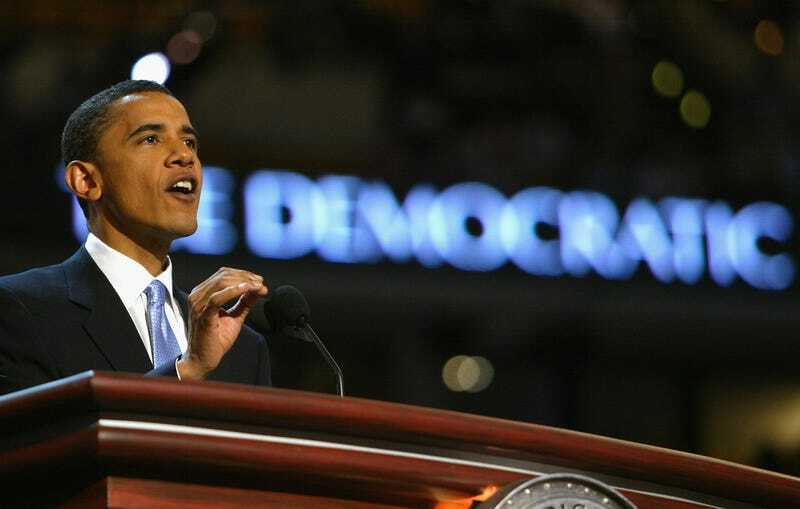 Then-Senate candidate Barack Obama delivers the keynote address to delegates on the floor of the Fleet Center at the Democratic National Convention in Boston on July 27, 2004. [T]here's not a liberal America and a conservative America; there's the United States of America. There's not a black America and white America and Latino America and Asian America; there's the United States of America. This proclamation was met with thunderous applause. There were tears in the eyes of many of attendees. I even found myself caught up in the moment as I watched it live on TV. He articulated something we could all believe in. Something we desired to one day achieve. It gave us hope. The only problem is that like many things said during political-party conventions, it was a fantasy. This week is the Democratic National Convention, and like Youngblood Priest in Superfly, politicians might as well walk to the convention floor with Curtis Mayfield’s “Pusherman” playing over the speakers as they push their falsehoods in the guise of hope. Obama’s statement about a unified country was not true then and is not true now. It’s a banal truism that, metaphorically speaking, we don’t all see contentious events the same way. Research on perceptual segregation suggests this is not just metaphorically true; it’s also literally true. Individuals from different social backgrounds will tend to have different implicit associations, spontaneous personality trait inferences, and judgments of perceived similarity, which will result different patterns of social categorization. These patterns of social categorization can be modulated, but only if one is aware of the patterns and their effect and one has sufficient cognitive resources to detect and revise these inferences and judgments. This discussion of social categorization demonstrates how our social differences influence our social perceptions. This means that when people from radically different backgrounds experience the same phenomena, they can come to very different conclusions about what they have seen. When Michael Brown was killed in Ferguson, Mo., many thought, “If only we had video—then we would be able to clear up this mess.” Then came Eric Garner, Tamir Rice and now Alton Sterling. What we have discovered is that video of these incidents can be just as controversial as eyewitness testimony. The lived experience of black and brown people differs so much from that of those who inhabit white bodies that when two individuals look at the same video, they can come to radically different conclusions—conclusions grounded in a tendency to attribute more-favorable character traits and motivations to those who belong to our in-group, but also grounded in the socialization that we receive. When you are raised in a culture that communicates hostile messages about people who are black and brown; that categorizes a young black man who makes a mistake as a thug, but considers a young white man as merely one who needs guidance, it is unthinkable to suggest that one is not affected by those stereotypes. Part of what we must do is be honest about the fact that we do not live in a unified country; that calls for unity when they leave the lips of those who live in relative comfort and privilege afforded to them by their white skin ring hollow if we are not willing to confront the myriad ways that racism still divides us. Black folks remain at the top of almost every bad statistical measure and at the bottom of most of the good ones. We have, for generations, been taught that we were inferior. Black women have been taught that they were born with the wrong lips, hips and skin pigmentation. Black men are considered violent and up to no good. These messages color our view of this country, and until those in power take seriously our calls for equity and listen with humility to our existential truths, there will never be peace. I think President Obama now sees that we are far from a united country. Honestly, I do not think we will ever reach that utopian state. We are to find meaning in the struggle against injustice—without any real expectation that we will reach our goal. Politicians will not save us. Political parties are a means to an end but still come up short. We must struggle, but that does not mean the struggle cannot be beautiful. Lawrence Ware is a progressive writer in a conservative state. A frequent contributor to Counterpunch and Dissent magazine, he is also a contributing editor of NewBlackMan (in Exile) and the Democratic Left. He has been featured in the New York Times and discussed race and politics on HuffPost Live, NPR and Public Radio International. Ware’s book on the life and thought of C.L.R. James will be published by Verso Books in the fall of 2017. Follow him on Twitter.